FFA - Magistrate judge releases Muslim terror suspect on bond, shorts public safety for political correctness. 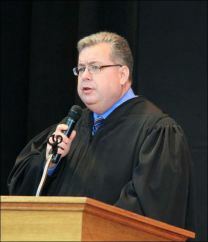 Judge James Knepp The email for this campaign has been deactivated . Over the objections of federal prosecutors, a judge agreed Monday to release on bond one of four men charged with providing financial support to al-Qaeda. Sultane Roome Salim, 40, of Columbus is to be released from the Lucas County jail once his mother posts a $500,000 property bond that includes her home and a commercial building in Cambridge, Ohio. Judge James Knepp, U.S. District magistrate, ordered that Mr. Salim surrender his passport and be released to the custody of his mother, Shakila Salim, and his wife of nearly 15 years, Mehreen Sultan. Ms. Sultan, a citizen of Pakistan, also surrendered her passport and the passports of the couple’s three children. Mr. Salim is charged with conspiracy to provide and conceal material support and resources to terrorists, providing material support and resources to terrorists, and conspiracy to obstruct justice. He was indicted by a federal grand jury in Toledo that also named his brother, Asif Ahmed Salim, 35, as well as Yahya Farooq Mohammad, 37, and Ibrahim Zubair Mohammad, 36. Judge Knepp told Ms. Sultan she would be in “a heckuva spot” if her husband violated the terms of his bond. She would be obligated to report him to the court, he said, and if she failed to do that, she could be charged with contempt of court and jailed. “If that sounds scary, it should,” he told her. Prosecutors allege the group conspired to travel to Yemen to give thousands of dollars to Anwar al-Awlaki, an al-Qaeda leader who was killed in a U.S. drone strike in 2011. Salim's mother, Shakila Salim, posted a $500,000 property bond using her Cambridge area residence and a local commercial building she owns. "I have been a judge for quite some time and understand the ins and outs of bond," said Nicholson. "This is an unbelievable decision on the part of the magistrate, and in my opinion the public should be aware of this decision and its ramifications." To read the full indictment at Justice.gov against Sultane Roome Salim and his cohorts click here. Judge Knepp’s statement to Ms. Sultan “If that sounds scary, it should” is scary itself. Judge Knepp actually trusts that a suspected terrorist who is alleged to be involved in supporting the killing of many people is actually going be concerned about the criminal consequences of violating bail. Judge Knepp’s release of Sultane Roome Salim shorted the public safety of all Americans for political correctness. Florida Family Association has prepared an email to express concern to Judge Knepp about his decision to release a terror suspect on bond. The email for this campaign has been deactivated .